Handmade quality vintage inspired dresses designed and made in the UK. Please note: This is not a costume jumpsuit and is made for all occasion such as weddings and prom' not just for "Gatsby" themed parties. Headband and accessories on model are not included. Due to the nature of the fabrics reaction to light the colour may vary from studio images provided. Please contact us if your unsure of the colour or the size that will fit you the best. Make your boho style come true with this Chic Cold Shoulder Jumpsuit. 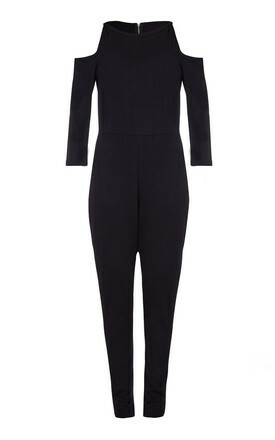 This Gorgeous Jumpsuit featuring Halter neck and Cold shoulder detailing with Centre Back zip closure. The fabric stretches by A size too. So, the fitting will not be an issue with stretchy fabric. Size L: Bust 38"/41", Waist 34"/37" Hip 43/45"
Size XL: Bust 42"/45", Waist 38"/41" Hip 46/48"
Size 1X/2X: Bust 46"/49", Waist 42"/45" Hip 49/52"
Please note: Returns will only be accepted if all original tags remains intact as received and returned back in original packaging. All our garments are 100% handmade & beaded by hand from scratch so the patterns on each dress may vary slightly (not 100% symmetrical) from piece to piece. Due to the quality of the glass beads and sequins used on the garments - they react to light differently therefore the colour also may vary slightly from the image provided depending on lighting. Loss of beads cannot be treated as faulty once worn. Please contact us with beading issues upon delivery. Returns are not accepted on worn items and cannot be treated as faulty. By removing the red warning tag on our garments you are accepting the terms and condition of Gatsbylady.